Eye Surgery Southland offers a personalised specialist service in ophthalmology with a highly trained team based in Invercargill. 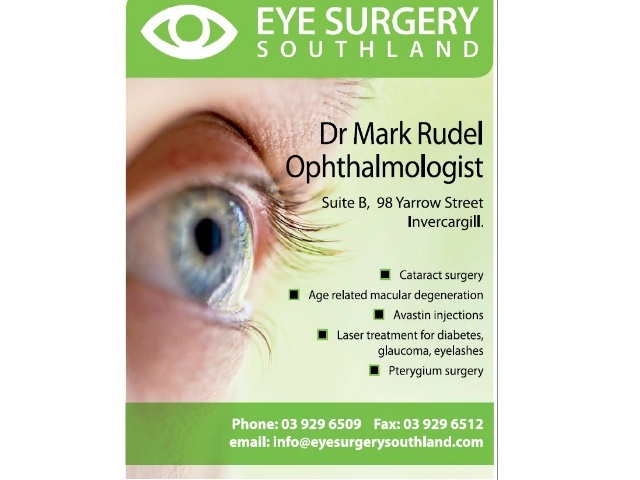 Dr Mark Rudel also works as a consultant ophthalmic surgeon at Southland Hospital, Invercargill. He graduated as an ophthalmologist in 1997, and has developed an interest in the management of age related macular degeneration, diabetic retinopathy, and cataract surgery. He has gained vast experience in ophthalmology working in Germany, Australia, Fiji, and New Zealand. Eye Surgery Southland specialises in treatment for age related macular degeneration, diabetic retinopathy, retinal laser for retinal vein occlusion and retinal breaks, cataract surgery with lens implantation, pterygium surgery, minor lid surgery, and laser treatment for glaucoma.